We have just returned from Vi’s, as we are now back in the Philadelphia area. Went into the office on Friday and learnt one bit of good news, and one bit of bad. The good is that when we are in Philadelphia we are going to get expenses after all, which is a great relief to us. They have made us an exception for which we are very grateful. So it now makes no difference whether we are here for a day or a week. The bad news was that we are being split up as from Tuesday. It appears that the other team of two is not very successful. One is a rather wild, irresponsible character, and the other is a quiet type who can’t control him. So I am having the wild one, and Colin is having the quiet one. Colin goes to Boston on Tuesday, and I stay here to do a few jobs, and then could go anywhere. They say it is an experiment to see if it works, and if it does we could go on with this arrangement for the next five months!! So I suppose the best thing is to make sure it doesn’t work. It seems crazy for us both to be travelling around the States with someone we don’t even know. So we are going to give it a try, and if it doesn’t work out we shall complain and ask to be teamed up again. They didn’t seem to mind about us having a red Mustang, and told us to keep it, which is very nice. We are staying at this motel now for the weekend – it’s just outside Philadelphia, and the reason we went there is because it advertises having an indoor heated pool. This is an understatement if ever I saw one. The water temperature was about 120 degrees Fahrenheit, and you couldn’t see across the pool for steam. It was hotter than some baths I have had. It was lovely for getting into, but too warm for enjoyment, especially as the steam made me cough. 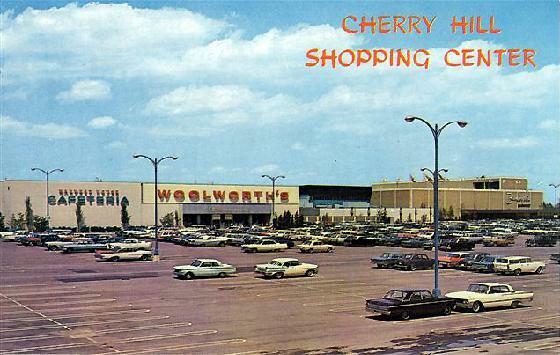 We went to look at the Cherry Hill Mall yesterday. ‘Shopping Malls’ here are very popular. They are usually outside big towns and are huge shopping areas, all indoors. This one contains 114 shops (some as big as Lewis’s, and some as small as your Skirt Shop). It’s all indoors and heated, and you walk down through avenues of palm trees, and tropical shrubs, and with tropical birds flying around. There are streams and lakes and it’s all very modern. They are all very similar, and this one even had a cinema and an ice rink in it. There are huge parking areas all around, and the women come in their cars in droves, and dump the kids in the play area, and go shopping. The malls are hitting the towns for six, and in Philadelphia two large stores have closed down, and a third is tottering. We went to see Vi on Friday and again tonight, and tonight we saw the film Herb shot when we were in Florida. It runs for 20 minutes and came out very well, although Herb’s hand isn’t as steady as it could be, and at times there is a bit of shake. But the colour is good and it will give you a good idea of what it was like in Florida, and the Bahamas. Herb is going to send it to you soon, and says you can keep it, so try and borrow an 8mm projector and a screen. You probably won’t receive it for a month or more as the post for parcels seems to be atrocious. I had better explain some of the scenes in case they baffle you. The opening scene is outside Herb’s sister’s house in Miami, the next is Colin, Herb and Vi on the beach and in the sea in Miami Beach (I wasn’t in this as I was at work). The piece of beach is right opposite the hotel where we were living (not the one we were working at). Next comes us all sunbathing on the sun deck of the boat on the way to Nassau. Later you will see us coming ashore from the boat, and this is followed by various shots of Nassau, and Vi in the Native Straw Market. Then comes a shot which may puzzle you. It is a view through the bottom of a glass bottomed boat, and you will be able to see the bottom of the seabed, which will show you how clear the water really is. The next scene is of us leaving the island on our way back to Miami. We then visited the fabulous Tropical Hialeah Race Track, and you can see the pink flamingos flying around the lake in the centre of the track. We then took a lot of film in the car on the beach at Jacksonville on the way home. Also you will see people surfing on Malibu boards. The last scene was shot in Vi’s diner – and isn’t very clear as the lighting was rather poor. However, you will see Colin acting as chef, and serving – and me eating. I hope you will enjoy seeing it, I am sure you will. We had a lot of fun deciding who was the ‘star of the film’, but I am sure you will decide that for yourself. Of course I am biased – but I think it’s me!! By the way I have received the socks – they were at Vi’s !! I also had two letters on Friday, one from Mum, and one from Dad. I was delighted to hear that Chris has passed his exams, I’m sure Carol was thrilled to bits. So the wedding is definitely on, I still find it hard to believe, I have told lots of people and each time I say it, it sounds strange. In answer to Dad’s letter, I sent a parcel over five weeks ago, and I thought you would have received it by now. I hope it hasn’t gone astray. Fancy poor old Kipp being bitten by a dog. I hope he’s ok now. Do you take him out in the car at all these days? We were contemplating getting a dog the other day, but the problems are really too great. But I would really love to have a dog with us. I don’t know why that postcard took so long to reach you, Colin’s took the same time!! I’m glad to hear you were duly impressed with the ceremony for your initiation (NB to the secretive Freemasons), although like Mum, I am very curious about it all. I hope you will enjoy the dance, and all the subsequent meetings. Well, I can’t think of much else to say so I will wind up now. Look after yourselves, and give my regards to all.